See All 20 of Barbara's Glyph Paintings (on silk) here. Dolphins are from the Star Sirius. From the beginning of life on Earth they are anchored in as Gaia´s Guardians. 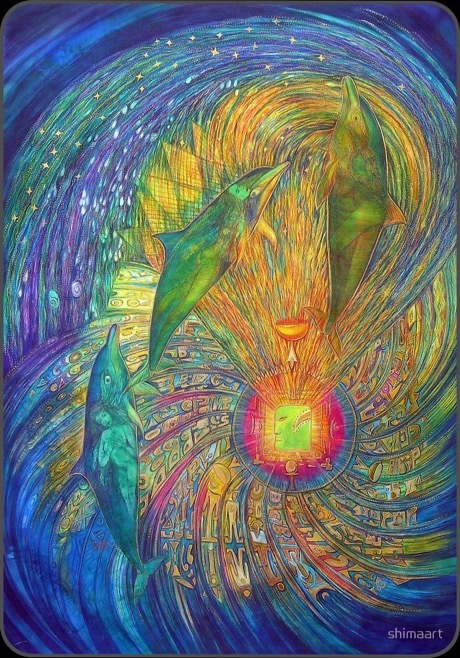 In my vision, two huge dolphins came to pick me up to show me the grid of light of humankind consciousness. They invited me to go into my heart and bring forth “light Seeds” and put them into the holes of the “light grid” to spark up a new flower of life. We were filling up the big gaps in a sort of netted flower of life grid. We did this for a while, them teaching me how to extend my hands out, filled with sparkling seeds. It was pure joy and Bliss. Telepathically I asked them about the gaps and why they are there. The answer was: Each negative act or thought makes the flowers weak, or it takes life out of them until they die finally. War is the worst for the light grid; but each loving thought or act creates these flowers. This is why the Guardians brought me here: to see them and to teach me how to fix the grid and communicate this experience with fellow human beings and let them know how to do this too. In the future, they want us to “grow up” (awakening) and watch the light grid ourselves, as “kind humans” who honour all life on Earth, instead of fighting and killing each other, which weakens or destroys the beautiful “light grid Garden”. We are supposed to learn to make “light sparks” in our hearts, which we can offer with our hands (giving) to fix the holes, to join the seeds of life in the grid. Together we are strong. To communicate and transport the vision shared above, I spent 10 years creating all 20 Mayan glyphs, each with different codes of information. In the beginning, I had no knowledge of the Mayan Calendar, but a great healer friend of mine activated this path for me. The glyphs merged perfectly with the information I had been given. In “realtime” this means creating new projects to give back to our Friends in the animal or fauna kingdom, and to listen to their rights to exist. It also means cleaning up our messy parts. This will be a good way to become our higher selves. More and more people will let the light codes nestle into their consciousness and this will enable them to create lots of “light seeds” in their hearts and to spread them generously, like Mother Earth. This will stabilize our global consciousness and we will grow up into guardians. We are supposed to march from Darkness to Light. Let Darkness be Avidya (ignorance) and Light be Vidya (knowlege), and reach to the Ultimate, which is neither of both, but beyond. Sit down and meditate, visualizing yourself creating lightsparks in your heart, bringing them into your hands to offer them to your fellow beings who want them. Blessings to all. We are One in this. I am an associate of NEOcat, a Project here in Fuerteventura which protects street animals. 20 % of my art sales goes to them. We accept Donations and any support for kind human consciousness.